It's funny how people start missing their childhood memories only when the stuff that they had grew up with are no longer around. I, for one, used to take the old playgrounds that I had played in when I was little for granted. And it was only the gradual disappearance of such playgrounds - and also the fact that both Ash & Ayd had taken a new-found special interest in these retro playgrounds - that I decided to bring them along on a crusade to hunt down the remaining old playgrounds in Singapore last year. In fact, the boys weren't the only ones who were interested in the playgrounds of Singapore. 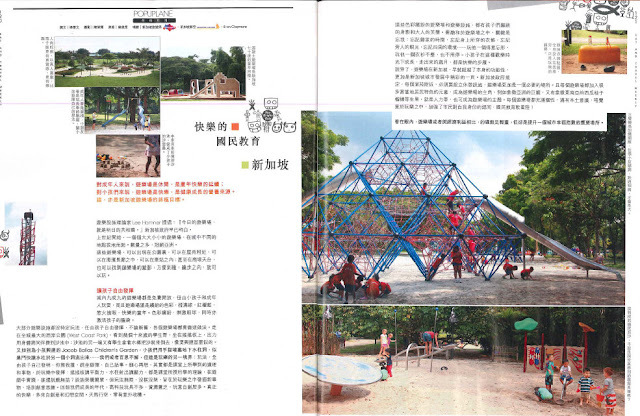 Back in December last year, a reporter from Hong Kong's Eat & Travel Weekly magazine approached me for assistance as he was in Singapore to write an article on the many outdoor playgrounds we have here. I directed him to the likes of playgrounds such as Jacob Ballas Children's Garden , Bishan-Ang Mo Kio Park, West Coast Park, Jurong Central Park and of course, the older playgrounds of yesteryears. Ayd even made a guest appearance in the article! Through our conversation, the reporter expressed envy that our kids in Singapore have so many free (and amazing) outdoor playgrounds to play in, unlike in Hong Kong. Hong Kong does have her fair share of outdoor playgrounds but compared to ours, they are much older and often in disrepair. 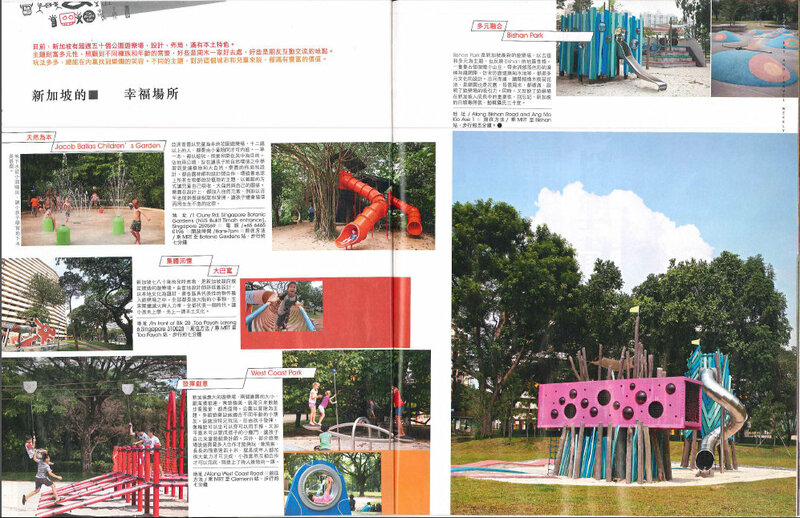 In addition, they are usually the normal play structures in a common playground and do not feature tall winding slides like those in Bishan-AMK Park or Jacob Ballas, Flying Fox equipment in West Coast Park, or innovative features like a huge Snakes & Ladders board game in Jurong Central Park. So yes, it pays to count our blessings sometimes. But that's not to say we can rest on our laurels. Certain memories are definitely worth keeping and preserving and it was with this in mind that a group of first-year students from the Wee Kim Wee School of Communication and Information in NTU decided to shoot a short video documentary on the old playgrounds in Singapore in a bid to try to raise awareness about these nostalgic places and their rapid disappearance. They came across my blog post that I had written about the Dragon playground and asked me if I was interested to share my thoughts on the old playgrounds in Singapore as well as the memories and experience that I had with my family. With such a perfect excuse to bring the monkies down to the Dragon playground once more, this time together with the SengkangBabies clan, it was a no-brainer. So while both Daddies were subjected to interviews - which may I add that we recorded in ONE take! - all six kids (Ale was blissfully asleep) were creating a boisterous atmosphere in a certain sleepy part of Toa Payoh. No thanks to their cheekie antics. I think the group of NTU girls found these kids too irresistible not to be interviewed. So it wasn't all play and no work for them too. Heh. And as Andy of SengkangBabies had mentioned in his post, we spotted no less than 5 different groups of people dropping by the Dragon playground during our filming duration. Some were families with young kids, who looked to have enjoyed their time there as well. All I can say is that it was fortunate that our kids' havoc didn't scare them off. All in all, everyone had fun and that was the most important bit. Thanks to the NTU girls for including our families in your meaningful project, and we look forward to viewing your documentary soon! Well, apparently that was what the reporter told me. Next time must try to find if I go to HK. Haha.